The Ontario Co-operative Association, in association with the Schulich School of Business at York University, has set a new standard for co-operative leadership and expertise. The new Fundamentals of Co-operative Organizations Certificate (FCO) Program is designed for staff, managers and board members of emerging and existing co-ops, credit unions and stakeholder organizations. Develop practical, transferable and co-operative skills. Gain unique and enriched co-op knowledge that will help you in your career path and give you the tools to help your organization succeed. Please read the BROCHURE to learn more about the FCO Program. Much more information is available from the On Co-op website or by calling their office at 1.888.745.5521 x.29. Each of the three two-day classroom sessions includes ‘up close and personal time’ with key leaders in the co-operative sector such as Kathy Bardswick, CEO of The Co-operators. The five 90-minute webinars include presentations and/or discussions with sector experts, and provide practical learning. The curriculum has recently been updated to provide you with critical thinking and the tools, skills and confidence to succeed. The three intensive classroom sessions are held at a Toronto location very near Pearson airport. You must be able to attend all three sessions in person. The FCO Program runs for 10 weeks. Attendance at all classroom sessions and webinars is required. Students from outside Ontario and Canada are welcome to apply, and there are no prior academic requirements. A limited number of bursaries (maximum $1,000 each) are available for co-ops less than 5 years old, or co-op working groups in the formative stages. Payment plans are available. Discounts are available for member organizations of the Ontario Co-operative Associations. The first webinar begins March 22, 2016, and the final classroom session ends on May 28, 2016. Class size is capped to ensure a low student/leader ratio. 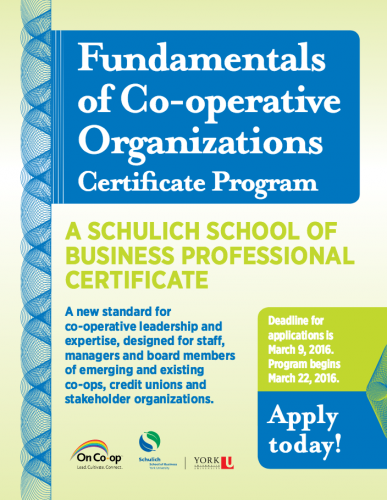 The Fundamentals of Co-operative Organizations Certificate Program can help you reach your personal and professional development goals. For more information contact Adam Malloy, Education Manager, at amalloy at ontario.coop.